Please find instructions on how to get to CERN here. Access to the CERN site is granted only to individuals in possession of an access card. Personalised workshop badges have been prepared for you. You will need to collect your workshop badge from the CERN Reception, building 33 (GPS coordinates: lat 46.233058, long 6.055692). Your workshop badge doubles as a CERN visitor card providing you with access to the CERN site. Workshop badges will be available for collection starting at 09:00. Can I enter the CERN site with my car? Yes, but a special visitor parking badge is needed. In order to get this, please send the organisers your license plate numbers. The visitor parking badge needs to be collected from the CERN Reception (building 33). Where is the CERN hostel? How to get in touch with them? The CERN hostel is located in buildings 38, 39 (reception), and 41. 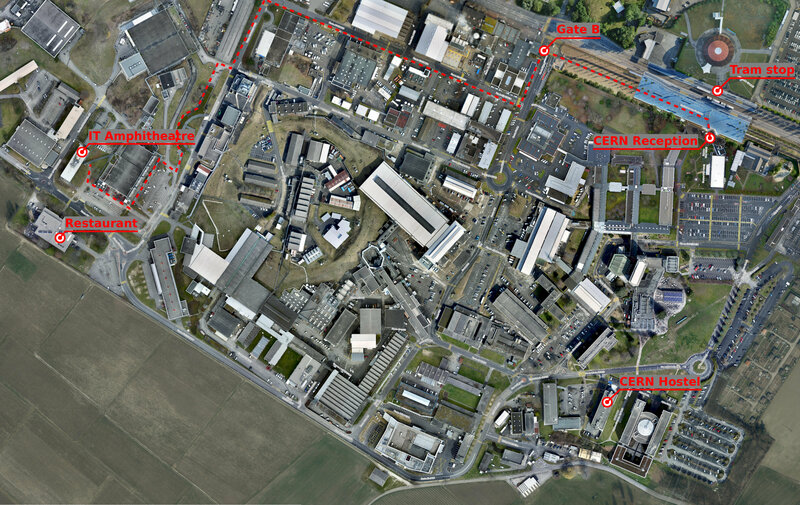 Check MapSearch to locate buildings on the CERN site. Please go to http://gs-dep.web.cern.ch/en/CERN_Housing for all information related to the CERN hostel. Does the CERN hostel offer breakfast? No, but there is a Restaurant ("Restaurant 1", building 501) located next to the hostel buildings. Where is the workshop room? The workshop will take place in the CERN IT Amphitheatre, building 31, 3rd floor ('3'), room 4. CERN Maps are available for the desktop, Android and iOS. A map of the CERN site on which the different points of interest have been marked can be found below. The dashed line shows the path to be followed from the CERN reception to the workshop venue. Eduroam is available on the CERN site. If you do not have Eduroam access, visitor WiFi service is available on the CERN site (registration via self service portal).